I have a feeling Matt Stafford will be on a lot of RSP Writers Project Teams. Reader 5-ish, whose knowledge rivals several writers I know, debuts a team for us below with Stafford as his starter. The RSP Writers Project has been a blast this week and there was a lot of fantastic feedback from writers and readers this week. After taking a quick time out this week to tweak the project, it is now back in full force with a lower cap, revised player values, and thanks to reader and Footballguys subscriber Donnie Smith, a spreadsheet that wasn’t created by someone who stopped learning how to use Excel in the early part of this decade. Here’s where you can download the new spreadsheet, instructions, and questions. One of the Footballguys.com staff’s favorite subscribers that frequent the Shark Pool message board is “5-ish.” He’s like many of our great subscribers, knowledgeable about the game, a good sense of humor, and always willing to engage in friendly debate. 5-ish submitted his RSP readers team after I changed the values of the linemen but before updated the salary cap. However, I thought I’d post his team in addition to other submissions I’ve received from readers. It’s a good preview of what’s to come with the writers. Values are in millions and his cap was $160 million. Matt Stafford 16 Our offense will be predicated on speed/big plays, optimally off play action, from the receivers rolling from a three-receiver, one-back base. Stafford has the arm and requisite skill with PA to make this offense “go boom.” Big arm, tough, mobile in the pocket and ballsy. Franchise player and starting quarterback. John Skelton 4 I’m basically rostering him in for his arm alone. 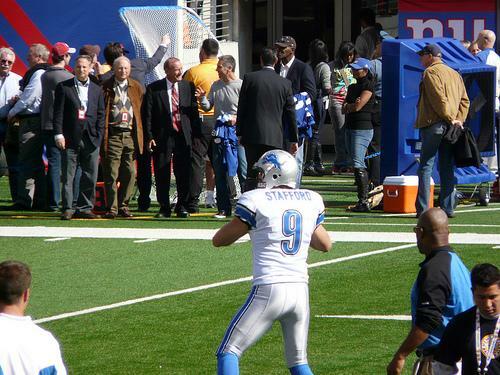 If Stafford goes down, at least my receivers aren’t going to be able to outrun Skelton. He has starting experience, which is a plus. Greg McElroy 1 Purely a developmental clipboard holder. He doesn’t really fit what this offense will need at quarterback, but he’s extremely intelligent and accurate. Hopefully he can be developed and dealt. Ahmad Bradshaw 5.5 This offense will be using the pass to set up the run, so having a good two-way lead runner seemed paramount. We’ll also be rolling with a zone blocking philosophy, so vision/cutback ability are also key. Bradshaw fits the bill for all of this when healthy. He doesn’t kill in the “team speed” department, but he’s more than fast enough, even after all the foot issues. Solid runner, solid receiver, solid blocker, and good vision. Other than concerns about his feet there really isn’t much here not to like. Starting tailback. LaRod Stephens-Howling 2 Kind of a “lower-cased Bradshaw”, in a sense, but with less value as a runner and more as a receiver/returner. LaRod could become a competent two-way committee back and is probably a little underrated as a blocker. If Bradshaw stays healthy, Stephens-Howing slots in nicely as the 3rd down back and primary kick returner. If Bradshaw gets injured, Stephens-Howling should be a more than viable speed component in a 1-2 punch with Tolbert. Mike Tolbert 3 Tobert’s a plus-short yardage player who can pass block and those are really the primary reasons he’s on the team, though I’ll readily admit the fact he has a bit of wiggle and isn’t a total loss as a receiver – certainly a bonus. He will get as many of the short yardage-goal line carries as he can handle and be given some 1st-2nd down work on occasion as well. Although we won’t list him as a fullback, he’d probably be the first guy we’d use there when one was needed. Da’Rel Scott 1 Cheap dart on another potential two-way type. Guy can fly, so he dovetails nicely with the offensive philosophy. Jalen Parmele 0.5 Another cheap dart, but on a back with a bit more size than the other true tailbacks on the roster. Should contribute on teams a little too. Mike Wallace 7 Probably the fastest receiver in the NFL. Still maturing and has room to improve his hands/routes, but even if he tables off where he is currently, in this offense he could be deadly. Starting split end, and really only one of two receivers on the roster who would have a “cemented” position(Amendola being the other). Mike is an outside receiver, period. Demaryius Thomas 6 Could be everything Wallace is and more, given his size. He’s also more willing to work the middle than Mike likely ever will be, thereby giving us some flexibility with moving him around to exploit match ups. “My ball” mentality, wheels, and developing hands. Starting flanker. Anquan Boldin 4.5 I’m viewing him as primarily a crossing route and red zone target, but not completely lacking as an outside threat yet. Balls of solid rock to boot. Starting slot receiver. Danny Amendola 3 Slot-only receiver, chain mover and No.1 punt returner. Clyde Gates 1 Speed, speed, and more speed. David Gettis 2.5 Project, but he has the size/speed/potential hands to be able to start eventually. 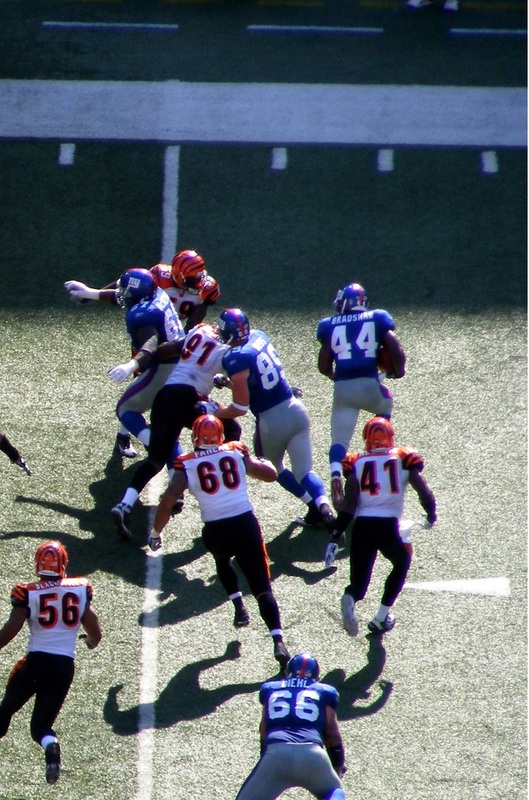 Jermaine Gresham 5 Under-appreciated and underutilized in Cincinnati, but that won’t be the case here. Gresham is a fine route runner, can hurt teams down the seam and he has the moves/speed to be a bear after the catch. Not a total loss as pass blocker either. Not the guy to keep inline and try to move a pile with in the run game, but as a “move” type he can crack off the edge and in a zone blocking scheme he totally has the agility to excel. Starting tight end. Delanie Walker 2 Move tight end/H-back that is a really nice fit as the No.2 tight end for this offense. Could play a little fullback or split to the slot if needed. This will allow the team to disguise formations when he’s in the huddle. He likely would contribute some plays down the seam as well if pressed into starting due to injury. Much better used in motion than on the line and, as with Gresham, we’d attempt to exploit that. Zach Potter 0.5 A “Hail Mary” on a physical freak. John Gilmore 0.5 Strictly a blocker, but a good one. Could line up at fullback if necessary. Tony Fiammetta 0.5 Strictly a blocker, and likely rarely used. Eugene Monroe 8.5 Near-perfect young left tackle for our scheme. Plus pass blocker, VERY solid run blocker, strong, probably one of the more mobile left tackles available too. There really isn’t a lot he can’t do. Playing in Jacksonville has really kept him off the radar and under-appreciated. Jason Smith 3 Pretty nice pass blocker and is extremely athletic. Moves well in space and can get there on sweeps, stretches and traps. Key for our scheme, so that dovetails nicely. Needs to work on his technique, but he’s hella young. Injury concerns may be an issue, but talent and athleticism makes it worth the gamble. Trai Essex 1 We’ll list him as the backup to Smith, but in reality he can play all five spots on the line without killing you. He can even long snap in a pinch. Jonathan Scott 1 Sort of a scrub, but he can play both tackle spots and projects far better in a zone blocking scheme than a man blocking scheme. Had to get a fourth tackle on board, and he was cheap/versatile. Mike Brisiel 4.5 One of the better “help blockers” on the interior in the NFL. Very mobile. Pretty good pass blocker. Only real rub is that he’ll take penalties. Montrae Holland 3.5 Underrated interior pass blocker. As this offense will be predicated on the pass, and I feel that pressure up the middle is the pressure that bothers quarterbacks the most, getting good interior pass protectors was key. He’s also quick enough to get ahead of sweeps/traps/stretches. Matt Slauson 1.5 Decent pass blocker and mobile. Could be a better run blocker if he could improve on technique. Strength is there. As a backup we will happily take it. Eric Wood 4.5 Near-elite pass protector at the pivot already that does a really nice job recognizing/picking up interior blitzers. He’s also great in space/on the move, which we’ve already mentioned will be key for our system. For a zone blocking center he’s more than capable in the run blocking department. Starting center. Doug Legursky 1 Blue-collar type that can also play G.
Want to know more about Ike Taylor’s value? Read on about 5-ishs ultimate Fire Zone corner. Photo by Firebrandal. Ike Taylor 5.5 Aging and not a take-away threat, but still likely THE Fire Zone cornerback to own in the NFL. Fearless, gets hands on the football frequently(too bad he doesn’t squeeze it, but whatever), rarely beaten deep and, although his attempts have reduced a lot over the last handful of seasons, is still an excellent blitzer from the cornerback spot. He hasn’t really lost much, if any, speed yet either. At this cost we’ll take it. Starting left corner, but will basically shadow the other team’s No.1 receiver regardless of position. Patrick Chung 4.5 When healthy and playing in the box he could be among the top play-making strong safeties in the league. In the proper scheme, I feel he could be a step below the Reed/Polamalu class, which would still be damn, damn good. This team intends to give him the freedom to “run to the ball” to find out if I’m right. Starting strong safety. Jim Leonhard 1.5 Savvy, coverage-type free safetythat should allow Chung to freelance with less fear. Could return punts in a pinch to boot. Brice McCain 1 Excellent slot cornerback with experience in a “pressure” type defense. Fast, nice ball skills, nice tackler. Nice teams player. Has the potential to be a starter and will fight it out with Tracy Porter for the No.2 corner spot, but having him as the slot guy/Kamikaze on the kickoff team isn’t a bad scenario. 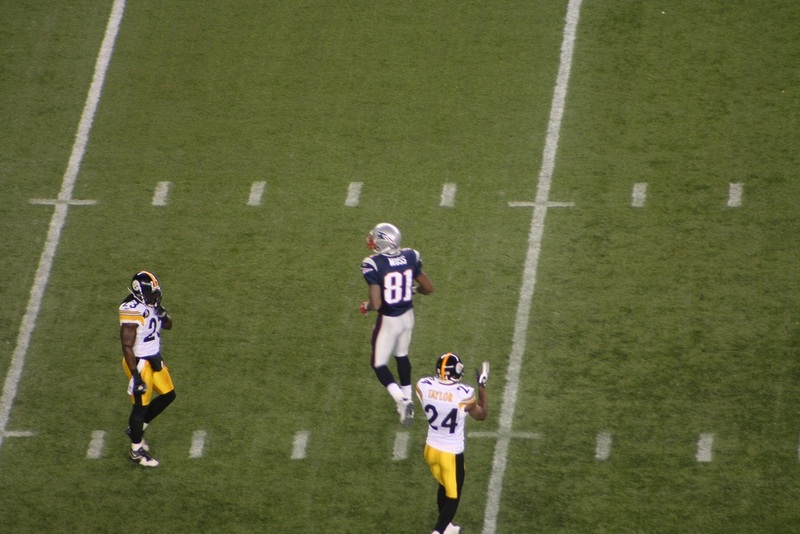 Cortez Allen 0.5 Young and raw, but talented. Appears to have the chops to be an eventual starter in the Fire Zone (was the only guy that stonewalled Gronkowski in ’11, for what it’s worth). Has looked good on teams. Nedu Ndukwe 0.5 Downhill player that kills vs. the run. Can blitz a little. Coverage? Uh…let’s not get him one-on-one versus anyone. Clearly someone we’d like to upgrade. Mike Adams 1 At this cost, he was totally worth taking as competition for Leonhard at free safety. His primary strength is in coverage so, like Leonhard, he would allow Chung to freelance with less worry. Solid tackler too. Tracy Porter 3 Young, fast and makes nice plays on the ball. At worst, a fantastic slot corner. The potential is there for him to be a solid starter at the No.2 corner spot. Lawrence Timmons 8 Absolutely the first guy I targeted at linebacker and one of the inspirations for my planned scheme. Already a “grizzled veteran” of the Fire Zone at only 26, if there is a better interior blitzer in the NFL for this scheme I don’t know who it is. Elite athleticism, elite speed, strong tackler and has been a plus player in coverage. His play recognition has improved every year and I expect that to continue. He’ll start at the Mack and, given his experience with the base system, be given every opportunity to be “The Guy” in the defensive huddle. Brian Cushing 7.5 Remember up there when I was waxing poetic about Timmons I said, “If there is a better interior blitzer in the NFL for this scheme I don’t know who it is?” I just remembered, if anyone else is wearing that crown, it’s probably Cushing. Pretty much does everything that Timmons can do and, like Timmons, Cushing has improved his read/react/recognition since he’s come into the league. Runs, tackles, covers, blitzes, and he is able to shed blocks quickly with his strong hands. My starting Buck LB. Whitney Mercilus 4.5 Big, young, and can get after the quarterback. Certainly, there will be some growing pains here, but he could wind up a terror in the Fire Zone. Starting WILL LB. Ahmad Brooks 3.5 Solid “do everything” type. Brooks is rock solid in most facets that a 3-4 SLB needs to be, although not great in any. He’ll probably be playing contain/coverage more than a typical 3-4 OLB in this scheme, but he has the chops(and hips) to do a competent job in that respect. Starting SAM LB. Jameel McClain 1 A solid veteran and downhill player with experience both inside and out in the 3-4. First player off the bench at either interior spot. Chris Carter 0.5 Developmental rusher. Greg Jones 0.5 Developmental thumper. Travis LaBoy 0.5 Backup at both SAM and WILL with some pass rush ability. Could play some DE in 40 fronts occassionally if needed. Zak DeOssie 0.5 Long snapper. Will never see a single snap at LB if it can be helped. Marcell Dareus 9.5 In my tweaked version of the Fire Zone, as in most 3-4’s in general, the nose guard position is of paramount importance. In this flavor I wanted to be certain that the scheme would be able to not only force doubles in the middle of the line, but to also be able to bring pressure on the QB from the center of the defense as well. I also desired to address this area with a player who would be around for a while, so that eliminated guys like Jay Ratliff, et al, from my list of targets. Dareus might be the perfect young nose for this scheme, even though prior to last season he was being viewed as a 5-tech defensive end. Sure, he isn’t the immovable object that the Hampton/Wilfork’s of the world are vs. the run(yet), but he showed in ’11 that he can certainly hold his own in that regard while still forcing doubles since he’s a)huge and b) too quick for his size to typically be dealt with by a single lineman. In subs, he absolutely has the speed/moves to be a force as a pass rusher, and even in the base D he has shown he is able to be a penetrator. Starting nose guard and probably the main cog of the defense. Red Bryant 4.5 I’ve always thought Bryant could be a monster in the 3-4. He’s got a great motor, can kill the run, he’s got the strength to take on multiple players and he has the long arms to bat down passes. Doesn’t get fooled often either. He can actually get a little push in the pocket, though it’s primarily from shoving guys back into the QB rather than running around them, but that works too. Starting RDE. Glenn Dorsey 3 Really came on in ’11 and appears ready to take the next step. Already a plus run defender, he has the raw ability to approach being in the “best all around 3-4 DE” conversation if he can just needs to harness it. Starting LDE. Igor Olshansky 0.5 Veteran depth with plenty of 3-4 experience. Adam Carriker 0.5 Veteran depth with some 3-4 experience. Could also move inside in 40 fronts if necessary. Not expecting a lot here. Taking a flier. Terrence Cody 1 Young, developmental, “immovable object” type for those times when we need to absolutely squash the run, or to create a near impregnable bulwark by lining he and Dareus up next to each when we move to 40 fronts. Billy Cundiff 1.5 Makes the kicks he should. Decent leg. Great on kickoffs. His cost vs. production should be very solid. I’m paying this offense to score touchdowns, not field goals, so going after a top tier guy didn’t make sense. Went with the “playing for field position” angle instead. Chris Kluwe 1.5 It’s a punter. I picked the one who digs video games. Ha!